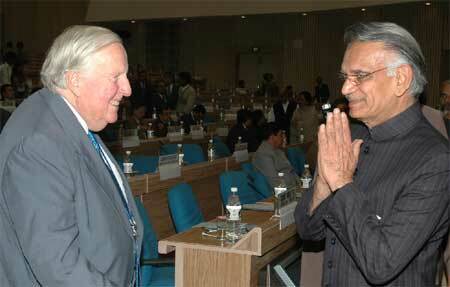 At the pre-conference in New Delhi before the 4th International Conference on Federalism, India’s Home Minister Shri Shivraj Patil greets Professor Ronald Watts of Queene’s University, Canada, one of the founders of the Forum of Federations. The Fourth International Conference on Federalism began Monday in New Delhi. The conference is organized by the Inter-State Council Secretariat of the Government of India in partnership with the Forum of Federations. About one thousand elected officials, cabinet ministers, civil servants and academics from 80 countries will be participating in the three-day event, to be opened by the Prime Minister of India, Mr. Manmohan Singh. The dignitaries expected to attend the event include Mr. Meles Zenawi, Prime Minister of Ethiopia; Ms Micheline Calmy-Rey, President of Switzerland; and Ms Rona Ambrose, President of the Privy Council and Minister of Intergovernmental Affairs of Canada. Previous international conferences on federalism were held in Mont-Tremblant, Quebec, Canada, in 1999; in St-Gallen, Switzerland, in 2002; and in Brussels, Belgium, in 2005. The Mont-Tremblant conference in Canada gave rise to the Forum of Federations. The main topic of the conference is ‘Unity in Diversity – learning from each other.’ The four main themes of the conference are diversity, fiscal federalism, interactions in a federal system and local government. Those attending are not only from most of the 25 federal countries of the world but also from non-federal countries who are interested in the process of devolution as a means of providing more powers and services to regional and local governments.